Myanmar isn’t a place you ever expected to be able to visit. But things have changed in the last few years. For once, they’re for the better. So you let yourself dream. In the back of your mind, you still didn’t believe it could become a reality, though. Then someone mentioned Thailand. Crossing the border from Ranong had become much easier. The Mergui Archipelago suddenly seemed accessible. You could do Thailand. Then your dream of seeing the limestone islands could actually come true. Your plans started to gel quickly once you committed to Myanmar. After a few days in Bangkok—why not, since you landed there anyway—you flew to Ranong, crossed the border into Kawthaung, and boarded a long-tail boat to sail out to the islands. You had a five-hour ride ahead of you. But the boat was outfitted with a kitchen and a gazebo. Plus there was the view. There are more than 800 islands in the Mergui Archipelago. Most are uninhabited. Some are home to the Moken people, who still build boats and fish like they’ve done for centuries. While one is home to a new eco-resort. Boulder Bay Eco Resort just opened last fall. It still feels undiscovered. The small resort, on its namesake bay, aims to produce a minimal human footprint. The community building, where seafood meals are served, is open air. Ten bungalows, hidden among the trees, stand on stilts. They’re simply decorated, though hammocks weren’t forgotten on the verandas. Sea kayaks, just waiting to give you a sea-level view of the island, lie on the deserted beach. Snorkel gear is ready to grab when you see movement in the water. Plus hiking trails wind to other beaches, better snorkeling spots, and high lookout points around the private island. 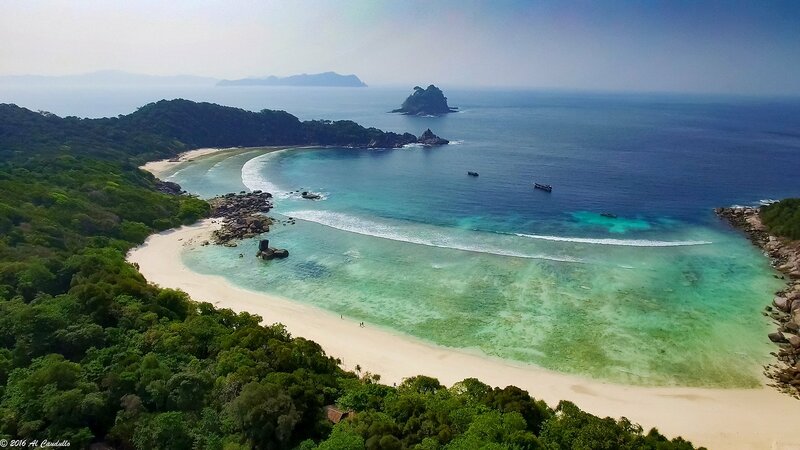 Nga Khin Nyo Gyee Island is one of the westernmost islands in the Mergui Archipelago. Though the island is only 334 acres, there’s a lot to explore. Clownfish and pufferfish, giant clams and sea urchins are right in your front yard—that would be Boulder Bay that you stare at from your hammock. Sisters Bay has even better snorkeling. Brain coral, orange spider conchs, and blue-lined surgeonfish are often spotted off the north shore. A trail leads to Bamboo Bay. You could see a large Malayan water monitor or a small golden tree snake along the way. Rougher paths lead to Cliff and Pebble Beaches when you want to feel like you’re on a deserted island. You could also stare at the views from the lookout points for hours on end. That’s exactly what you plan to do on your first morning. Now that you’ve made it here, you don’t want to take your eye off Myanmar.